Keep your tools at their peak performance! Keeping the blades and pivot areas of pruning tools clean is the easiest and best way to extend the life of a pruning tool. We recommend the ARS product, AC-GO1 for cleaning pruning tools. It is fantastic at removing difficult stains and debris. Keeping blades sharp minimizes the strain on lever handles (e.g. hedge shear handles), increases cutting leverage, and reduces the effort required to complete cuts. 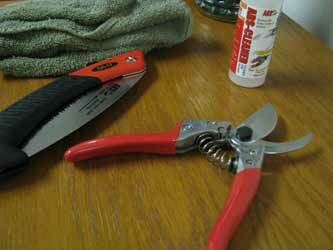 We recommend two ARS products for sharpening pruning tools. The AC-SS240 is a standard whet stone that is perfect for use on hedge shears, hand pruners, long reach pruners, loppers, and scissors. The AC-9F10 is specifically designed for sharpening tri-edge pull saws. General tips for using a whet stone can be found here (whet stone sharpening tips). Instructions for using the AC-9F10 can be found here (AC-9F10 sharpening tips). Over time, nuts and bolts can be jarred loose. This can lead to nuts and screws falling off and being lost, especially for long reach pruners. Periodically, and especially after cleaning, a thread locker can be applied to securely hold screws and nuts in place, minimizing future maintenance and frustration. We recommend Loctite Purple (222 MS) for its holding properties. Loctite Blue is very difficult to remove and Loctite Red even more so. We have been told by some of our users that super glue has good holding properties, but it is not something we use (and hence can't recommend). It's amazing what lubrication can do to make tools operate like new. It should be applied to any friction point periodically, but especially on areas like blade pivot bolts, handle pivot bolts, and long reach pruner rod drums (where the rod connects to the handle). We recommend any general machine oil (e.g. Liquid Wrench or 3 in 1). Machine oil not only acts as a lubricant, but also a rust preventative, which helps extend the life of a tool. We recommend this particularly for blade sets. For long reach pruner rod drums, we recommend a heavier, longer lasting lubricant (e.g. Liquid Wrench's White Lithium Grease). Rods for longer long reach pruners are expensive (in part to oversize shipping charges). Reducing friction at this key point will not only extend the life of the rod, but help ensure smooth operation.